SEATTLE, Wash., Jan. 29, 2018 – Foss arrived this week at the Port of Ponce in Puerto Rico with seven barges loaded with 498 utility trucks as part of the on-going effort to restore power to the island. Offloading of the vessels is underway. 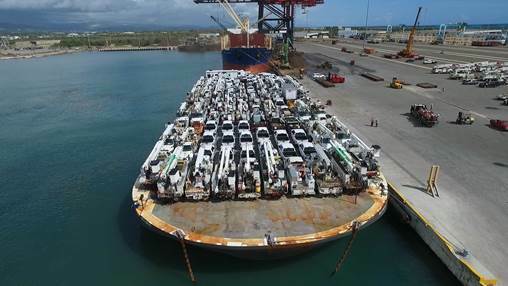 The shipment, from a coalition of 19 U.S. electric companies, included bucket trucks, line trucks, pickups, aerial lifts, CAT skid-steer loaders, digger derricks, and pull trailers. More than 1,000 line workers and other personnel from participating electric companies have flown in to meet the trucks and start work supporting the Puerto Rico Electric Power Authority (PREPA) and the U.S. Army Corps of Engineers (USACE) to restore power. Foss made the voyage from the Port of Virginia in Norfolk and the Port of Lake Charles in Louisiana to Ponce, Puerto Rico safely, in under two weeks, with five barges and two ocean-going tugs. 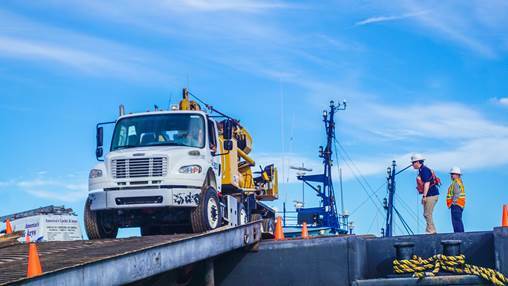 In addition to the company’s latest project shipping utility trucks, Foss has been working in conjunction with Government agencies in support of relief and rebuilding efforts in Puerto Rico and the U.S. Virgin Islands for several months. 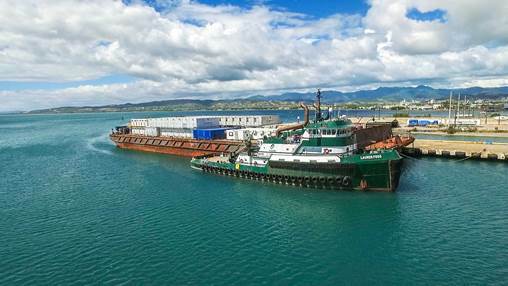 Under contract with FEMA, Foss arrived at the island on October 19, 2017 with three accommodation vessels, an ocean-going tug and more than 100 personnel, to provide warm meals and “floating hotels” for hundreds of first responders, including workers from the U.S. Department of Defense, FEMA and AmeriCorps. The company has also been contracted shipped a load of power equipment and three loads of water to the island.